What does it mean to describe a worldview as Humboldtean? 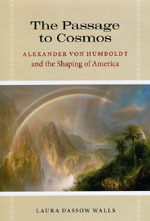 Prussian aristocrat Alexander von Humboldt (1769-1859) traveled extensively, gathered specimens, produced drawings, formulated grand geophysical theories, and never shied from describing the earth’s processes on a global scale. While his brother Wilhelm lent his name to “Humboldtean education,” Alexander is associated with “Humboldtean science,” expansive and ambitious. Most geographers see Humboldt as an intellectual forebear, and it is hard to find works on the rise of environmental consciousness that do not acknowledge him. His convictions that all phenomena were connected make him a sympathetic figure to modern scientists, environmentalists, and environmental historians alike. Moreover, Humboldt exemplified the Romantic-era tradition that embraced the world of science and the world of letters as if they were part of the same whole. His five-volume opus, Cosmos, was an enormous attempt to demonstrate the unity of knowledge, written long after his traveling years were behind him. In The Passage to Cosmos, literary scholar Laura Dassow Walls has shown us how Humboldt the explorer produced this unitary worldview. Throughout the book is a sense that the division between the humanistic and scientific traditions is itself an unfortunate historical development. Perhaps we can learn something from Humboldt. It seems appropriate that the book itself easily crosses over stiff academic boundaries, not just between science and the humanities, but also between literary criticism and history. The book already has won several awards, and the range is indicative of the book’s appeal across such boundaries. The Organization of American Historians awarded it the Merle Curti Prize for intellectual history; the Modern Languages Association awarded it the James Russell Lowell Prize for literary studies; and the Society for Literature, Science, and the Arts awarded it the Michelle Kendrick Memorial Book Prize. For this roundtable, I solicited comments from scholars of exploration, geography, and the history of science. Felipe Fernández-Armesto has written that history has two big stories: how human cultures diverged thousands of years ago, and how they found one another again. Since the 1970s, Fernández-Armesto has been writing about these encounters, beginning with the quintessential patrons of exploration, Ferdinand and Isabella, and later exploring the creation of colonial society in the Canaries, an area often perceived a template for later colonial expansion. Since then he has written books about Columbus, pre-Columbian exploration, the Spanish Armada, and other topics on a scale that has made him a leading scholar of world history. Michael F. Robinson also writes on the history of expeditions and uses it as a lens for understanding the meaning of exploration in American culture. For Robinson, the scientific content of the voyages often gave way to stories of masculinity and conquest, as ships traveled to more obscure and harsh environments in the latter half of the nineteenth century. For Robinson the stories do not stop with the voyages themselves, but rather they continue to the process of men coming home, defending claims, and trying to “cast themselves as men worthy of the nation’s full attention.” Robinson continues to probe these topics through his exploration history blog, “Time to Eat the Dogs.” See timetoeatthedogs.com. Michael S. Reidy and Daniel Zizzamia have co-authored comments here that reflect Reidy’s existing expertise, while introducing us to Zizzamia’s insight as he works on his doctoral dissertation.Reidy’s past work has illuminated the rise of geophysical sciences in the nineteenth century, showing the relationship between natural philosophers and the Royal Navy that was so central to the success of voyages and expeditions. His work not only contextualizes the story of disciplinary growth, but also implicates men of science in the consolidation of empires. He has argued that natural philosophers adopted the spatial approach of Humboldt, with its influence on mapping and data collection over large areas, and in so doing complemented the expansion of British imperialism. Innes M. Keighren shares with Walls a fascination with the reception of geographic texts over time. He has written about the influence of German geography on the United States during a later era, particularly the westward movement of Friedrich Ratzel’s ideas through Ellen Churchill Semple, who studied with Ratzel in Leipzig at the close of the nineteenth century. Semple’s 1911 Influences of Geographic Environment is the classic of environmental determinism that shaped geographical thought in the English-speaking world (especially the United States) for a generation. Before turning to the first set of comments, I would like to pause here and thank all the roundtable participants for taking part. In addition, I would like to remind readers that as an open-access forum, H-Environment Roundtable Reviews is available to scholars and non-scholars alike, around the world, free of charge. Please circulate. A recent book that draws the connection to environmental thought explicitly is Aaron Sachs, The Humboldt Current: Nineteenth-century Exploration and the Roots of American Environmentalism (New York: Viking, 2006). Felipe Fernández-Armesto, Ferdinand and Isabella (New York: Taplinger, 1975); Felipe Fernández-Armesto, The Canary Islands after the Conquest: The Making of a Colonial Society in the Early Sixteenth Century (New York: Oxford, 1982); Felipe Fernández-Armesto, Before Columbus: Exploration and Colonization from the Mediterranean to the Atlantic, 1229-1492 (Philadelphia: University of Pennsylvania Press, 1987); Felipe Fernández-Armesto, The Spanish Armada: The Experience of War in 1588 (New York: Oxford, 1988); Felipe Fernández-Armesto, Columbus (New York: Oxford, 1991); Felipe Fernández-Armesto, Pathfinders: A Global History of Exploration (New York: Norton, 2006). Michael F. Robinson: The Coldest Crucible: Arctic Exploration and American Culture (Chicago: University of Chicago Press, 2006). Quote on p. 2. Michael S. Reidy, Tides of History: Ocean Science and Her Majesty’s Navy (Chicago: University of Chicago Press, 2008). Innes M. Keighren, Bringing Geography to Book: Ellen Semple and the Reception of Geographical Knowledge (London: I. B. Tauris, 2010).